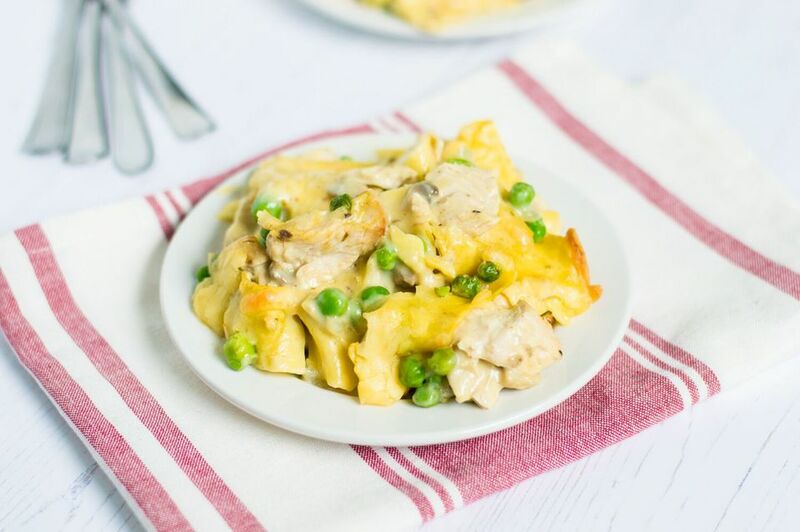 This turkey and noodle casserole recipe is an excellent way to use leftover turkey. Or you might choose to make it with chicken or ham. The casserole comes together with a simple sauce, mushrooms, vegetables, and shredded cheddar cheese. The easy sauce for this casserole is made with condensed soup, so there's very little prep involved. A dash of curry powder and poultry seasoning add flavor to the sauce. Just cook the noodles, combine the ingredients, and bake. Use drained canned mushrooms to cut prep time, or omit the mushrooms and use cream of celery or cream of chicken soup instead of cream of mushroom. If you're cutting carbs, this turkey divan is another great choice. In a large bowl, combine the thawed peas with the diced cooked turkey and cooked noodles. In a medium saucepan, melt the 2 tablespoons of butter. Add the onion and mushrooms and cook, stirring, until tender. Blend in soup, milk, and seasonings. Continue cooking, stirring frequently, until well blended and hot. Pour the soup mixture over the turkey and noodle mixture and blend thoroughly. Turn the noodle mixture into the prepared baking dish and top with shredded cheese. Bake in the preheated oven for about 25 to 30 minutes, until hot and bubbly. If you like a crunchy breadcrumb topping on your casseroles, combine 1 cup of soft breadcrumbs with 2 tablespoons of melted butter. Sprinkle over the cheese layer before baking. Replace the peas with steamed mixed vegetables or peas and carrots (about 1 1/2 cups).